The new T-Mobile senior plan is a good competitor to the Verizon senior plans and the AT&T senior plans. 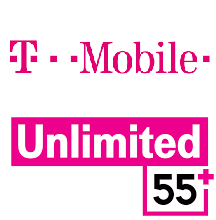 The T-Mobile unlimited 55 plus plan has many advantages over the two mentioned cell phone plans for seniors, it offers the first line unlimited everything for just $50 per month with autopay and allows to add a second line for $20 only. Unlike Verizon Wireless and AT&T Wireless, T-Mobile included the taxes and fees in the plan price. Let’s preview the features of the plan. Citizens over 55 years old can get two lines of T-Mobile ONE unlimited plans, which offer unlimited talk, text, and 4G LTE data for just $70 with autopay discount. The T-Mobile 55 plus plan is the best deal, especially for the smartphone users. You don’t have to pay additional taxes and fees. Customers under 55 can get the ONE unlimited plan for $100 per month/ two lines so, seniors get about 40% discount. This is a no-contract plan so you can change the price you pay anytime. Unlike most of the known cell phone plans for seniors, the T-Mobile senior plans are suitable for both the basic phone users and the smartphone users. As an example the Verizon plans for seniors Costs $30 per line for 200 anytime minutes plus 500 night and weekend minutes, if you think to add a 2 GB limited data plan, you’ll pay $30 more and also you should not forget the taxes and fees. A no-contract plan so you can change the price you pay anytime. Mobile Hotspot available, connect your devices to the internet via tethering data. Enjoy global unlimited text and data roaming. Flat-rate calling to more than 140 countries. On all Gogo-equipped domestic flights get unlimited texting and one hour of free GoGo mobile WiFi service. In November 2018 T-Mobile announced starting November 7 for a limited time, all customers on T-Mobile unlimited 55+ plan who activated prior November 2, are eligible to add a third line. The total price for the three lines is $90 with autopay and includes taxes and fees.